•	DOUBLE BOWLS OF EQUAL SIZE: Conveniently use bowls independently for washing, soaking, rinsing, drying and other household tasks. •	QUIET: Sound-deadening material minimizes sound and vibration for a quieter time at the sink. •	U-CHANNEL INSTALLATION: Mounting clips placed inside the channel before installation mean less time under the sink for an easier install. 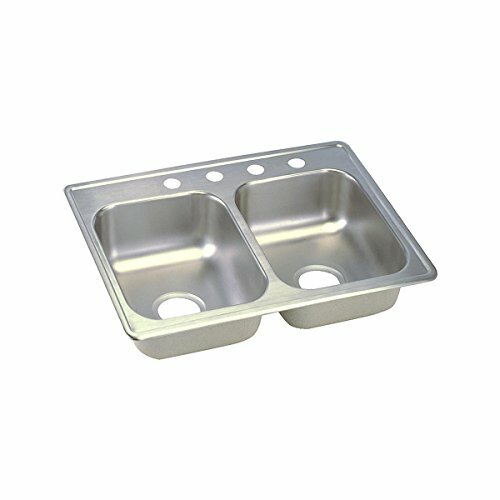 •	LARGE CAPACITY: Straight sidewalls give the sink a flat bottom and offer more usable space for stacking, soaking and washing dishes; easy to clean. •	CABINET SIZE: Minimum cabinet size for this sink is 30".